Never did I think I would say I was jealous of a 14 year old, until I met Rachel Crow… let the admissions begin. When I first started doing my research on former The X Factor contestant Rachel Crow, my initial thought was, “D***, girl can sing! !” Seriously, how is it fair that a girl who has barely gone through puberty, can be so talented, yet I struggle to hold a note?! But after hanging out on her tour bus and talking about everything from high-waisted shorts to putting a stop to bullying, I realized that this so-called “teeny bopper” can do so much more than sing. She can inspire. Rachel realized her dreams of stardom when she was 3 years old. “I would stand in front of the TV and move to all the commercials,” Rachel explained. “This sounds terrible, but the Victoria’s Secret commercial would come on, and you know, you’re little and you’d think, ‘They’re so pretty, Mom,’ and so I’d be like, ‘Do that, do that, be on TV, be like pretty girls!” Rachel was performing at fairs and attending acting auditions with 100 percent call back rates (BTW — that’s pretty much unheard of… clearly, fate was in her favor), when she saw a commercial for The X Factor auditions, and decided to give it a go. Well, we all know where that got her… the young girl we watched fall to the ground and sob uncontrollably when eliminated from the show was signed to Columbia Records, and is now touring with Big Time Rush, and prepping to star in her own Nickelodeon show. The X Factor was her beginning to a very promising future (careful — control the ugly green monster). Rachel was recognized as a great role model for kids when her first music video “Mean Girls” hit the web, which shows Rachel and real, everyday girls being bullied by their peers (shown above). Rachel’s mission with the video is to show people that she can be strong and make a change, and that no one deserves to be bullied. The video has a powerful message, in a time when kids really need to hear it (I literally got goosebumps). So let’s make #MeanGirls go viral, no? Be like Rachel, and brush all of those mean girls out of your curly hair! As if singing and acting isn’t enough, Rachel also works with DoSomething.org to reach teens and encourage them to make a difference in their communities. Share your story — how do you make a difference? 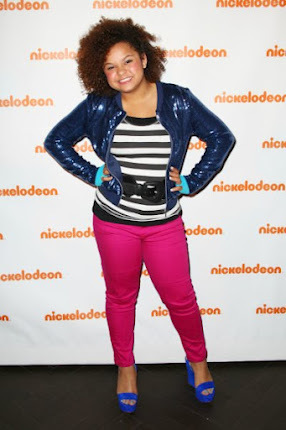 For more on Rachel Crow, check out her interview below!